In the first in a series of articles on mental health, Karen Meager and John McLachlan examine how to recognise and approach depression. Ninja skills! Think Productive's Graham Allcott gives TJ yet more great productivity tips. Tom Brown introduces our new column where the focus is firmly on government. 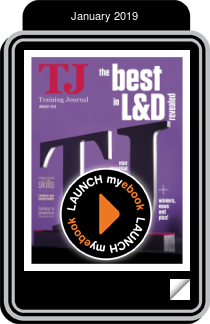 In the second of his quarterly columns, Richard Barkey tackles sales methodologies, and shares some insights from the TJ Conference. Evernote's Beat Buhlmann gives us some easy productivity tips to kick the year off. Hello 2019! We take an extensive look at the recent TJ Awards ceremony and all the winners. Who doesn't love a listicle in January? Here's a couple, detailing a few things to look out for over the coming year. Sarah Kaiser believes that this year companies will be forced to think more strategically when it comes to global issues of diversity. This month, Jo Cook examines a painful feedback session and urges us to take our interpersonal skills more seriously. TJ editor Jon Kennard looks at the most popular pieces from the year gone by. Jon, Jo and Kate catch up in Berlin and talk OEB, Patti Shank discusses her most recent work, and we outline the best bits of this month's magazine too. Olympic champion Ben Hunt-Davis gives TJ some well-earned advice about performing under pressure. A nice reflective piece to end the year - Penny Power OBE reminds us to be kind to ourselves. Remote working can keep the workforce unified, says Jon Loftin. Where are all the difficult people? Ever wondered if the difficult person is you? Michael Fleming says we need to take stock once in a while. Mark Gilroy concludes his piece linking behavioural economics to learning. Bryce Sanders gives us advice on how to stay positive during the reorganisation of your business. Collaboration is the key to change leadership, say Sarah Cook and Steve Macaulay. Why is the internet so overwhelmingly male? And other stories this week in the newsflash.